If a child is at least one year old and within the weight range indicated by the child seat manufacturer, the child should be properly restrained in a firmly secured forward-facing child seat. 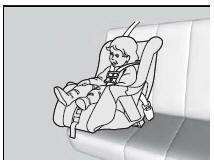 We strongly recommend placing a forwardfacing child seat in a rear seating position. Placing a forward-facing child seat in the front seat can be hazardous, even with advanced front airbags that automatically turn the passenger's front airbag off. A rear seat is the safest place for a child. Placing a forward-facing child seat in the front seat can result in serious injury or death if the front airbag inflates. If you must place a forward-facing child seat in front, move the vehicle seat as far back as possible, and properly restrain the child. Educate yourself about the laws and regulations regarding child seat use where you are driving, and follow the child seat manufacturer's instructions. Many experts recommend use of a rear-facing seat up to age two, if the child’s height and weight are appropriate for a rear-facing seat.